A screenshot of the mod's settings page. 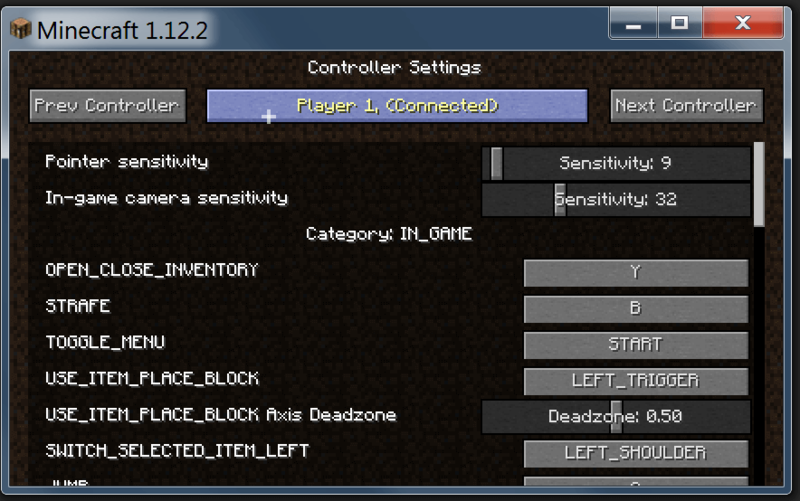 Developed in early 2018 onward, this is a mod that uses MinecraftForge to enable controller use for the PC version of Minecraft. Instructions for setting up and using are in the repository readme. Once setup, it's as simple as turning on your controller and pressing "run" in the IDE. The Mod uses XInput and should work anywhere XInput is supported. A playlist diff tool and a playlist copier for Spotify. Built with Angular during Summer 2015. This is a collection of old programs I've written I found in old saved archives. Select programs have a short description. Notepad - 2011-3-4 - A notepad that draws everything in custom canvas coordinates. Not really a good idea, but something I wanted to try. BIRCA (Brent IRC App) - 2010-12-15 - an IRC chat client that implements (from what I can remember) the most basic parts of the IRC protocol to get you connected and talking in a channel. BrentIRC (version 1) - 2010-10-05 - My first attempt at a crummy IRC client. RSS - 2010-9-29 - A hilarious attempt at trying to parse XML uses regexes. picwin_mp3.mrc - 2008-12-23 - One of the first programs I was really proud of. It was a music player for mIRC (written in mIRC scripting language) that used 'picture windows' for display. Picture windows were essentially a canvas you could draw on. Messy. oldmp3.mrc - 2008-09-10 - An older mp3 player that used mIRC native dialog functions instead of a picture window.